“Don’t stop” I shared with my client. I’d already explained why you should not stop when working with walking issues. But it’s hard for humans to not stop and address. The other day Elsa and I were out and about very early. I enjoy getting our walk in as the sun just starts to rise. It’s quiet, peaceful and just what we both need to start our day. Also as we are now into spring and nearing summer; early walks are an essential part of living in Southern California. So we were out walking when I saw a man and his small, white fluffy dog far off. I’m a scanner, something I think is also essential when you are a canine guardian. I saw him as soon as he stepped out onto the path. Like I said, he was far off. He quickly kicked into his training mode when he spotted us. He told his dog to sit and continued to tell the white fluff that there was nothing to worry about. Clearly the dog had leash aggression. Where the leash aggression came from I do not know but this is how he was dealing with it. He was addressing the issue wrong (in my opinion). Our dogs are master readers, meaning that they see everything that we do. Each and every movement or request we give is a cue to them. So what may seem like a reasonable control request can soon become a cue for an issue. Let’s take leash aggression like the man mentioned above was dealing with. His dog may not have seen Elsa and I but as soon as the man stopped, the dog would have begun to scan. It is a cue that the dog takes when another dog is approaching. This man not only asked his dog to sit; cuing the dog of some impending danger but he did so from far, far away. They sat there for the longest time…like the Austin Powers steam roller segment in the movie. What he should have done in lieu of stopping and waiting…forever, was to keep moving. Keep moving and show his dog that we were a non issue. When a dog has behavior issues with something; be it an inanimate object, other dogs, people with big hats or little kids; it is our job to show them that these things are non issues and keep moving. Of course this means that you must learn to reward on the fly. Counter conditioning implementation on the fly can take some practice but it is well worth it. Conditioning - a process of changing behavior by rewarding or punishing a subject each time an action is performed until the subject associates the action with pleasure or distress. So if every time you see the trigger for your dogs reaction, you stop; then it only fuels that reactive behavior. When you keep moving you instill a “who care” attitude so that your dog can learn that it means nothing to you. Then by adding something good, a tug toy, treats or a ball to the situation; it then goes from a bad thing to a good thing. Make sense? Love to hear from you. Leash issues are the biggest and most common thing that people deal with. Looking down at my wrist, I didn’t have to think long before coming up with today’s blog topic. Puppy biting, ahhhhh…those wonderful/horrible little piranha teeth. The above image is where Mr. Riggs raked his ever so sharp k9 across my wrist. My husband and I had been away for five days at a family event; and when we returned home, both Elsa and Riggs were over the moon with joy. Well, this is how it played out for me. As I stood soaking up the blood dripping from my arm; I discussed the past five days with my pet sitter. We were both surprised by the scrape because Riggs is very much a soft mouth. I feel very lucky to have a lesser piranha that many puppies. Oh, I’ve had really bad piranhas over the years. Both Tilley and Elsa were horrible piranhas; and I clearly remember hearing “MOM” when my kids couldn’t handle the biting. Puppies bite and they should bite so that we can teach them to bite/nip gently. Puppies who never lay a tooth on another creature never get the feedback required to learn how to use their mouths correctly. The first thing that many new guardians do when I arrive for a training session is to very angrily say “NO BITING” as their puppy begins to feel me out. I quickly let them know that I am fine and that I want to gauge their puppy’s bite inhibition. As I talk to my new clients; asking questions about their puppy, I am being chewed upon and assessing. Puppies need feedback, it is how they learn. Without feedback how are they to know if their biting is bad or not? So when I address nipping it starts out with the hardest biting and moves on from their. We offer feedback for the ouchy bites first. Then move onto the lesser and lesser pressure bites. Finally moving onto the “no teeth on skin” rule. This rule is the k9 guardians to make or not. Having your puppy play with other dogs can really assist with bite inhibition. Other dogs will let your puppy know when they are using their mouths incorrectly. Other dogs will yelp or scold a puppy for biting too hard. This is what we need to do as well. Paying close attention to the pressure of a bite; offer feedback for the hard ones. A loud “OUCH” is typically enough feedback for a learning curve. But if you have a puppy that does not respond to a loud “ouch” then leaving the room abruptly may be required. The scrape shown above on my arm was from an over exuberant k9 tooth raking across my arm in joy. Riggs was doing the very typical arm hold greeting. Unfortunately puppy k9s are the last to go. He has lost the bottom right one but still has three more. I will be more than happy when they are gone. First alone walk on the beach, big time life experience for baby Riggs. You’ve got a new puppy, where do you begin? What are the first things you need to do? Let’s discuss. With the addition of a new dog to your home and family, there is much to do. I cannot tell you how many times I’ve heard from new guardians “I don’t know what to do?” Puppies are a lot of work and there are many important things to teach them before you even get started on the official obedience stuff, that is other than “sit.” “Sit” is so very important to teach right away; it is the beginning of learning about manners. We have a new puppy and it has been a ton of work; puppies are a substantial amount of work up front. But the pay off for all your hard work is a well mannered k9 member of the family. Like humans, all puppies are different; each comes with it’s own personality and issues. Some require more work than others; there is not a one size fits all when addressing the addition of a k9 to your family. With Riggs nearing the 5 month mark, we’ve been busy. For the last 5 days my husband and I have been away on a family trip. What this means for us is getting back at it hard and intense. Much of the rules and regulations that I have instilled have gone by the wayside with my absence. So we have started off this day with strict rules and Riggs is remembering easily. Without even addressing the obedience stuff (other than sit) there is so much to work on. Food guarding, nipping, jumping, house training, crate training, socializing (life experience) and so, so much more. Our human world is vastly differently than that of the k9. It is our job to assimilate them into our world as best we can. Some have a more difficult time than others but they can all “get it,” with our help. As our dogs age and things start to become easier, we will drop the ball to a degree. This is how we humans work for the most part, myself included. So when we begin a new relationship with a canine we must start off with a bang. That new little canine brain has got so much to learn in a very short time. And I have to say that I cannot believe what they can learn in a fraction of the time that we learn. They are amazing, truly. Congratulations, you have a new dog. You’ve done your research and decided that you are going with positive training. First, good for you; your dog will thank you for it. There is much to know about positive reinforcement training; the first and most important part is timing. Timing of the delivery of the reward, be what it may. Timing will be saved for another blog; today I’m discussing the actual treats or rewards. What do you use when? The difference between the results of using a low value versus a high value treat can be amazing. Low value treats are used around the house when you want to say “yes, that is what I like.” High value rewards are used for difficult times, big distractions or major attention requirements. Just the other day I took Riggs to a favorite walk destination where Elsa and I have frequented over the years. It is a marina/harbor on the coast. Dana Point Harbor is beautiful and a must see for anyone visiting from out of town. The walkways through the yachts, pelicans, squirrels and turquoise water is a hot spot for folks walking with or without a dog; and is a great place to get in some quality life experience. Recently on some of my “live” sessions on FB I have explained how walking Riggs is very much like walking a kite. Well, that’s the best way that I can describe it so I knew that I’d need to up the value of my treats if I’d want some attention in such a high stimulus area. Armed with a full pouch of ground turkey and beef we head to the harbor. Yep, messy, messy. The difference was incredible. As soon as the first piece of beef/turkey was delivered I had Riggs’s undivided attention. The contrast between low value and high value was remarkable. In fact I had to lower the value at times during our walk so that he could experience everything around him. When I needed undivided attention, I got it. But positive reinforcement is not all about food; it is about incorporating whatever motivates a dog. I use a great number of reinforcers - tug toys, balls, catching , a squeaker, whistle etc. You need to know what motivates your dog. If it is food then you need to dish out the rewards appropriately. That means that they need to have the right amount of value for the moment. Too little and they are useless; too high and the dog cannot even think straight. It is a juggling act. Value - relative worth, merit, or importance: the worth of something in terms of the amount of other things for which it can be exchanged or in terms of some medium of exchange. It’s not what we consider to be valuable; it is entirely up to our dogs on what is valuable. This is why it is essential to know your dog. Or to have a trainer who can very quickly discover what motivates your dog. If you aren’t sure what you are doing, hire a trainer. Buy a great book or schedule and online consultation for extra help or some questions that you might have concerning the whole “reward system” of positive reinforcement training. Now, go train your dog. Leash aggression has got to be the most common problem that k9 guardians deal with on a regular basis. Leash - a chain, strap, etc., for controlling or leading a dog or other animal; lead. Aggression - the practice of making assaults or attacks; offensive action in general. There are many reasons for leash aggression and most are not true aggression. Leash aggression can be caused by fear, over excitement, lack of education or a misplaced leadership status. There are some cases that are truly dominant aggression but most are not. Even the friendliest of dogs can display leash aggression. Let’s take Mr. Luke (now gone nearly 4 years) for example. He was one of the worst leash aggression cases that I worked with, yep my dog. The funny thing about Luke was that he was also one of the friendliest and most stable dogs with other we’ve ever had. He was a rock solid lover, not a fighter. Even if a dog picked a fight with him; he’d laugh it off, turn on a dime and head the other way. Many a dog were left standing alone as he chose not to fight, ever. But the love of my life sure had a blustery case of leash aggression. So where did it come from? As soon as we strap a leash onto our dogs they change. Their ability to move and communicate freely is taken away. They are also close to us, their guardian and may have a guarding behavior kick in. Body language communications are misread as our dogs movement is restricted. Excitement can be misread as aggression when a dog strains at the end of the leash. Back and forth the dogs are misreading much of what could otherwise be a friendly greeting. A few bad experiences can lead to leash aggression as well. A face to face greeting gone wrong can lead to going on the defense. I am not a fan of face to face on leash greetings. Dogs get tangled, get too close, send wrong communications due to the leash etc. etc. 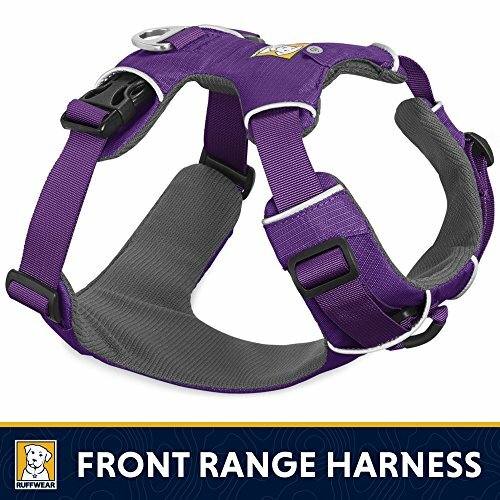 So what do you do if your dog displays leash aggression? You find the trigger and change the association. Is it other dogs? People? Cars? Once you discover the trigger then you find what most motivates your dog; food, balls, tug toys, catching etc. Then you associate the trigger with the great stuff. Depending on how bad the leash behavior is will factor in on your time to full or partial recovery. If you really want to get rid of leash aggression; then you will implement many different things to connect a positive association to the trigger. One of the biggest factors in leash aggression is us. 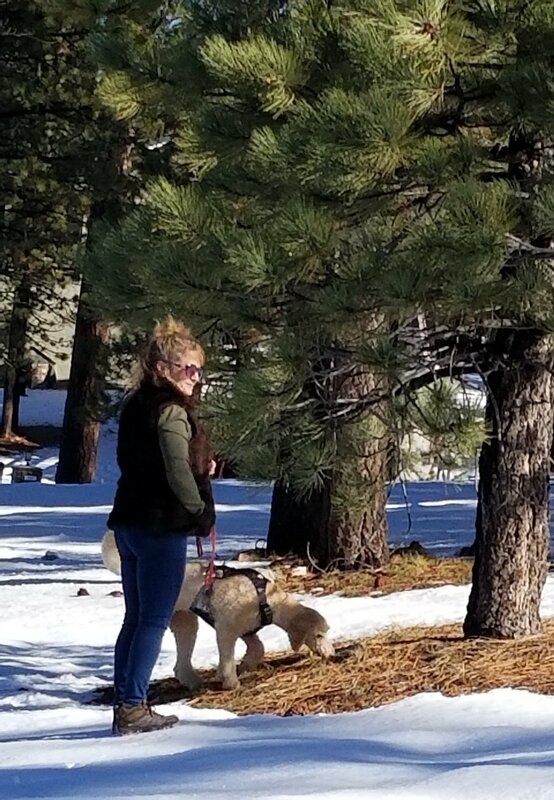 Yes, we humans can fuel a leash aggression problem so it is imperative to get a grip and get your chill routine down to a t.
Hire a trainer to help, they will let you know what you are doing right and wrong to solve your leash issue. Canine behavior is an intricate thing. It is imperative as a canine guardian that you get to know your individual puppy or dog. Each dog is different so how your dog responds to a stimulus will be different compared to how my dog responds. This past weekend my husband and I took Elsa out for a good hard run. When we got back she was exhibiting some strange behaviors. What can sometimes be a normal occasional leg kicking thing became strange when it was happening over and over. Elsa was donkey kicking her left back leg and chewing at her foot. She was kicking her foot drastically as if something was stuck on it. Several times I went over her foot; feeling between her toes, her ankle and around each nail bed. I could find nothing. Something was definitely bothering her. My husband and I sat watching her; trying to figure out what was going on. Could it be a bee sting I wondered? I ran and got a Benedryl just in case. If it wasn’t a bee sting, the meds would just make her sleepy and I wasn’t taking any chances. Looking closely into her eyes it did look like her pupils were dilated a bit. Watching is so important when you are trying to figure out a change in behavior. I was witness to her anaphylactic response to a bee sting years ago and didn’t want to see it again. I got a wet cloth and prepared to clean her foot. It was bothering her so I was very careful. I gently held her foot and dabbed the cloth on the bottom of it. Her response to this was a huge and high donkey kick which landed just above my eye. It happened so fast and landed hard. She stood there watching me. I hadn’t anticipated a kick in the eye. I went back to watching. We changed our plans for the day; she was not being left alone until I saw that she was going to be okay. So off we went to the car wash, storage unit and then home for a nap as her benedryl kicked in. After waking from her nap she was a new woman, she was fine. I don’t know if she indeed got a bee sting, perhaps twisted a toe or what but she is now fine. A change in behavior is always worth noting. Dogs don’t just change for nothing. Of course there can be changes that happen over time but when it is sudden it is important. There could have been many different things that caused her to be making sudden and drastic donkey kicking motions. The important thing is that she’s fine now. Super happy and her normal self. I’m super happy too. Have you ever met someone that you thought was a good person; only to find out down the road that they are very far from being good. Some people think they are wonderful yet exhibit behaviors that others would never consider. Self centered humans do things that show their true and horrible colors. Those who take, take, take without a second thought to the wake of destruction that they leave in their path. They don’t care who they hurt as long as they themselves are happy. Sadly, I’ve met many of these folks and I wish I hadn’t. These hideous people have many different agendas. Greed, a sense of entitlement and the me complex all come from being self-absorbed, self-obsessed, self-seeking, self-interested, self-serving. Self, self, self. Good people make mistakes but those who continue and continue to tromp upon others to reach their own personal goal are not good. We have a choice who we deal with and create relationships with in our life. Those people who think about just themselves can be easily weeded out by us. It is all up to us. Puppy Millers would fit into the self centered category. Do they care about the dogs they breed? No, they do not. They do not care about the adults they have stuffed in cages, the puppies who are going to new homes or those people who are buying their puppies. All they care about is the money that puppy buyers put into their hands. They are some of the worst. There are good and bad all around us. There will always be good and bad people. Choosing to deal with those who do good for others; put others before themselves and always strive to do better are those who I like to have in my day to day. The people who step on top of and over other folks to get where they or what they want, not so much. I don’t want them in my life. When dealing with dogs, choose the best. Choose the breeder, rescuer, Veterinarian, kennel, dog sitter and trainer ;) who really cares. I’ve met people in all of these above walks of life who should never be doing what they do. In fact my poor old Tilley and I were asked to never return to a Veterinarian when I asked to be with her while she had her blood drawn. Does this sound right to you? Didn’t think so. The same Veterinarian was the one who completely misread here blood work; thinking that a high white cell count was nothing to worry about. After going to another Vet and handing over her blood results he quickly saw a big problem. Many of these unscrupulous types have a huge fear of being found out. They are very secretive about everything they do; keeping their “public image” as intact as they can for as long as they can. But the truth has a way of coming out and when it does it spreads like wildfire. I have seen many of these scenarios play out and the path of lies and deceit that unfold can be unbelievable. It is almost unimaginable to know what some people will do to others, be it animal or other human. Life is filled with good and bad. With research we can sift through and find the ones that we want to deal with, no matter what type of dealing that is. Honesty is the core of someone great. No human is perfect, but if they are honest, there in lies the best part. I remember making a call to a rescue group years ago. I asked if I could come to see a particular dog that they had at their facility. They did everything in their power to persuade me not to come. Even so much as telling me they could drive the dog to me. Honest? I think not. Another call I made to a rescue of Giant sized dogs several years back uncovered some big time lies after much digging. Research is important; not funding or supporting unscrupulous, self centered people is important when we want to do what is right. It is the base of why you should never buy from a pet store. Do we want to support those who subject dogs to horrendous cruelty? Nope. The world is filled with good and bad. Thankfully the good outweigh the bad. Meeting, dealing and getting to know those great ones is what makes this world of ours a great place. Toss the bad. Sheppelley, service dog in the making. I was excited to see her again. It had been 5 months since I first looked into those dreamy eyes. Just a week ago I spoke to this gorgeous girls breeder about seeing some of the puppies that I had temperament tested back in May and she told me about Sheppeley and Lindsey. In April I had contacted Craig and Laura of Poodle Store about their beautiful puppies. We chatted back and forth about health and temperament testing and they asked me to come and temperament test their litter in May. I was thrilled, temperament testing is my favorite part of being a dog trainer. Spending a couple of hours with 7 week old puppies is never a bad thing. So in May I head to their home to test 9 seven week old puppies. I love temperament testing; it is such a fascinating and enlightening test. Each puppy is brought out alone to a stranger (me) in an environment that they have never been before. They are put through a number of tests to see who they are and what sort of family they would best thrive in. After doing the whole litter I exclaimed “really nice litter.” Of course when I’m testing a litter I usually fall for one or two of the puppies myself. In this litter I had a favorite in the the girls and the boys. But the little brown and white girl with the beautiful eyes really stole my heart. Now I found myself meeting Sheppeley (Claire when I first met her), the little girl who had stolen my heart so many months before. It was at Sheppeley’s new home where I met her human; the one who chose her to be her service dog. Sitting down in their backyard, I watched. And what I was witnessing was pure magic. I have never seen such a devoted 7 month old. She watched her guardian like a dog much older than her age; and had a calm about her that made me wish I had brought her home with me when I met her. After meeting Lindsey and seeing the amazing connection they have at only five months into their relationship; I was happy that I had not brought her home with me. Here is where she was meant to be and I have never observed such a kismet moment. Lindsey is a phenomenal woman. At 26 years of age she has been diagnosed with Dissociative Disorder, Social Phobia, Bipolar and Rheumatoid arthritis. Sheppeley will be Lindsey’s psychological service dog; and the human/canine team are already extraordinary to watch. It is almost unbelievable to see Sheppeley at work at only 7 months old. Her job is all about watching her charge and learning to sit still. As I listened and watched, Lindsey told me about her search for a service dog. At every turn she was brought to the Standard Poodle. Once she’d decided on the breed she searched for a breeder and was turned away many times because of her list of diagnosis. That is until she found Craig and Laura. She explained her situation fully to them and not only did they not turn her away; but they offered to pick her up and bring her to see the litter on a day when she was having severe driving phobia. They helped her pick out the right dog for her and have continued to stay in touch. Great folks going above and beyond. Lindsey and I sat and talked for an hour and a half. Sheppeley was so well behaved for the entirety of our discussion. She had one little puppy moment of wanting to eat a leaf but other than that she was watching Lindsey and responding to anything she thought she might need to alert. finding exits in a building for Lindsey. forward momentum pull, to ground Lindsey and get her moving. cover, standing in front of Lindsey to get her needed space. block, standing behind Lindsey to get her needed space. corner check, checking areas where Lindsey feels insecure or paranoid about going in. Sheppeley will check it out before Lindsey goes in. alerting Lindsey to her mood changes and anxiety. Lindsey is a naturally amazing dog trainer. Not only does she need a service dog to help support her but she is training Sheppelley herself. 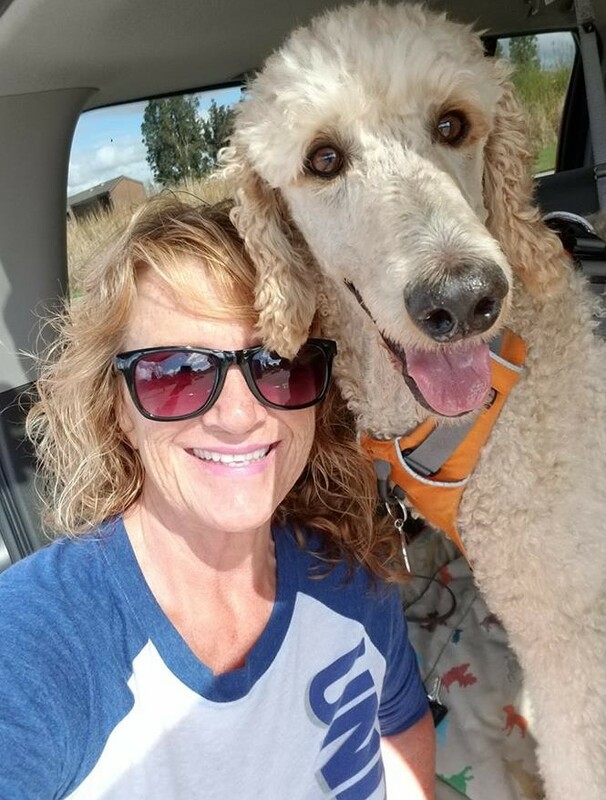 Lindsey credits her earlier years with horses plus her good friend and dog trainer Charlie Ridge for producing her intuitiveness in training. Charlie’s unconditional support has given Lindsey her true passion for dog training and that passion emanates from her. As we sat and talked, Lindsey’s attention never left her duty to Sheppelley. She is quick to give feedback and get Sheppelley on the right tract. After about an hour of watching them work together I said “you are always in trainer mode.” “Yep” she replied. So for now while Sheppelley is in training; if Lindsey is hit with anxiety or a mood change, she needs to be working through it while teaching Sheppelley, which is a huge challenge. Lindsey told me that she was overwhelmed when she first brought Sheppelley home by the sheer magnitude of what lay head. She has since set to task for what needs to be done; knowing that in the near future she will benefit from her hard work and dedication. She has a lot of work ahead of her and has already run into some obstacles. She told me that because she is not in a wheelchair or visibly handicapped she has been judged about having a service dog. Especially now because there are so many fraudulent service dogs out there in public. But her attitude is to take the high road and try to educate when she can. I know I learned a great deal from her and much appreciate her candor in telling her story. Being that I have lived with Standard Poodles for over 33 year I was curious about Sheppelley’s grooming. 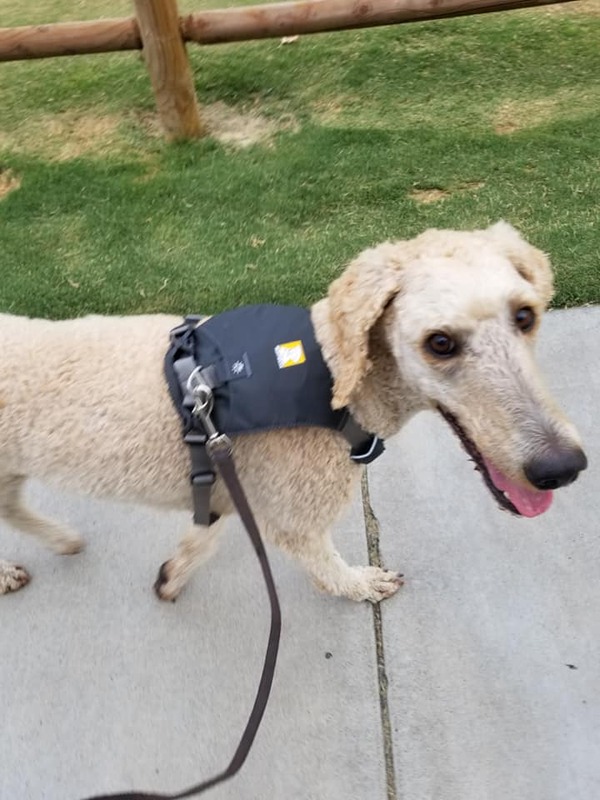 When I asked Lindsey about Sheppelley not looking “poodley” she stated that because she knows she may be judged for needing a service dog; she wants Sheppelley to look as much like a “working dog” as she can. Although from where I sat there was no doubt that they are working and extremely serious. Sheppelley is an extraordinary little lady. At seven weeks of age when I first locked eyes with her, I knew that she was special. She was a little pistol with something extra. She had that something that you can’t put a finger on, but know that it is there. At 7 month old now she is incredible and her dedication to her human, fascinating. When I temperament tested this little girl; her eye contact was what drew me in. I love eye contact and she offered an abundance of it. She came readily and was very happy to meet me, a big plus. Sheppelley had little startle visually and offered more eye contact during the restraint test. Aside from a nice temperament test; she had that something extra that made me think she was going to be a very special dog for someone. I was not wrong. Sheppelley will have a big job to do and I know that she is up for it. Seeing her sit and watch Lindsey’s every move at just 7 months of age gave me a glimpse of what she is capable of. Sheppelley’s natural ability to watch and respond to her humans needs are impressive to watch. It seems like she was born to do this job and is very happy doing it. When Sheppelley is working she wears her Service Jacket. When she is not required to work she has it off and can do as she pleases. Her jacket specifies that she is in training and that you should not touch her. This is very important as she goes through her training and learning to pay strict attention to Lindsey. Sheppelley is well on her way to becoming a phenomenal service dogs, thanks to Lindsey’s need for her and natural talent for training. Sheppelley will not only help Lindsey once she is trained; but already helps by simply being Sheppelley. Her need for around the clock canine daily care gives Lindsey a job that needs doing. Lindsey states that her life is fulfilled with Sheppelley in it. The two are quite clearly unstoppable and will make a mark on this world of ours. Sheppelley is already alerting about 15 times a day for Lindsey. She is learning what needs to be alerted on and what doesn’t. Their partnership and connection is new but intense. I have rarely seen such a bond between new guardian and puppy at this age. I want to thank Lindsey for sharing her story with me and Sheppelley for being the missing piece of the puzzle in Lindsey’s life. I would also like to thank Craig and Laura from Poodlestore for being wonderful breeders and humans. I feel honored to have met all these wonderful humans and Sheppelley.